"Immunology at a Glance" provides a concise and accessible introduction and revision aid for undergraduate medical and science students. Following the familiar, easy-to-use at a Glance format, each topic is presented as a double-page spread with key facts accompanied by clear, informative line diagrams illustrating the essential points. 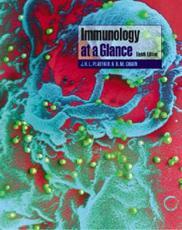 This new edition of "Immunology at a Glance": contains a second colour throughout to enhance the visual appeal and present the subject even more clearly presents schematic diagrams and a brief text on the left page and concise explanations on the right to show the mechanisms involved in immunological processes has been thoroughly revised and updated with new chapters on: recognition and receptors immunity and clinical medicine. "Immunology at a Glance" will continue to appeal to all students of biomedical science and medicine who want a quick, yet thorough, grasp of immunology.